Click here to Donate to LAF for a chance to win a $10,000 donation! Life After Fifty volunteers and staff served Strawberries and Ice Cream during the 30th anniversary of the LaSalle Strawberry Festival. Our volunteers included members,friends, family and high school students. Together we had a great time dishing it out over the four-day festival. Many of our volunteers commented it was a great experience as we were busy with a variety of work to do including cleaning, prepping, serving and selling. As our teams pulled together, we could hear the laughter and commraderie of all ages under the strawberry tent. 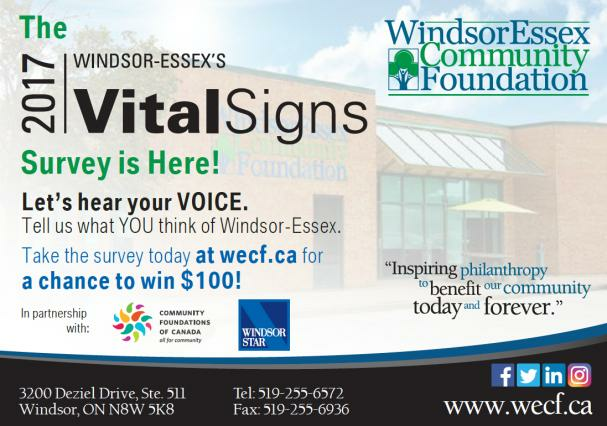 A special thanks to the Town of LaSalle for making this annual event happen for the Windsor-Essex community. 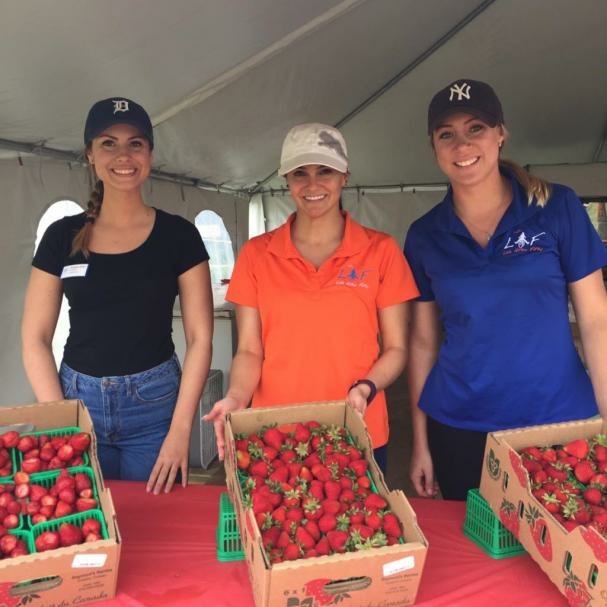 The fresh and tasty berries were provided by Raymont's Berries, grown in Cottam, Essex County. Our LAF volunteer coordinator, Mary, is berry wonderful for reaching out to everyone and keeping us organized! LAF has many volunteer opportunities available year round. If you are interested, click here for our volunteer page. On Monday June 6, we had a lot of fun during LAF Fitness when the Caesars Windsor Heroes Team arrived to make an important announcement and to join us for class! 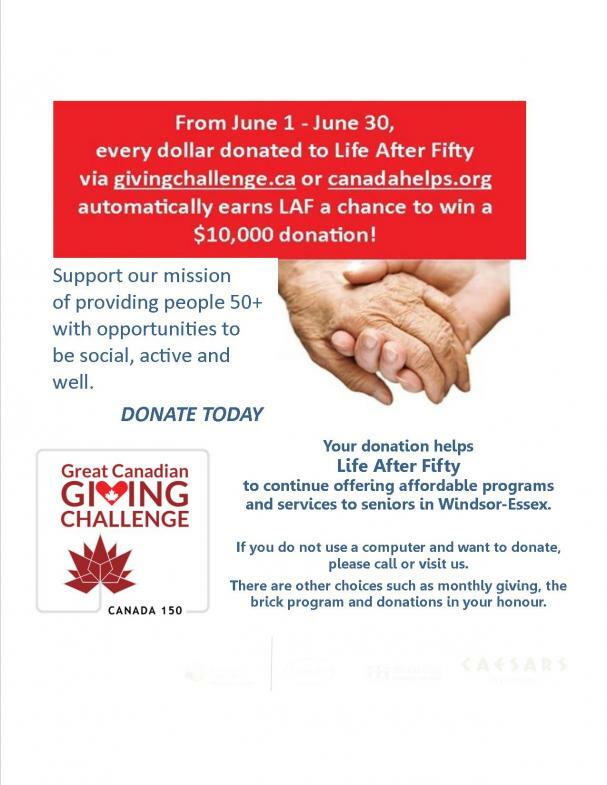 Caesars Windsor has giving Life After Fifty a sponsorship this year for "LAF Movement". Through their support we will be able to subsidize fitness programs, buy replacement equipment and expand some of our programs, such as bringing back Belly Dancing for members to try. Caesars also provided some show tickets that we raffled off to members. The Heroes also offered us water during exercise as we all had a great workout! Seniors are special, and we have a special month in honour of "us"! June is Seniors Month. Our mayor, Drew Dilkins, has proclaimed the month of June as "Windsor Seniors" Month. 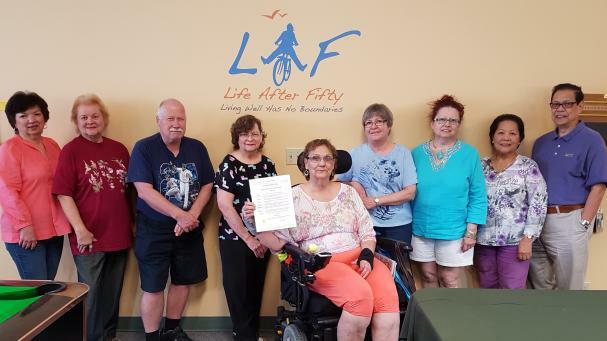 On June 1st, some of our members gathered by the WSC billiard tables to start the celebrations, with a member holding the proclamation for all to see. We also tweeted this proclomation to share our message. At Life After Fifty, we will be holding some special events to recognize senior contributions including our membership meeting (June 20), LAF Spirit Day Mosaic BBQ (June 21), and Better Living Day (June 22).